I love ArcheAge, really. When Bioware announced a massive experience boost for The Old Republic in preparation for the launch of the next expansion, I had to make a choice: Continue subscribing to and writing Diaries From ArcheAge articles, or allow my subscription to lapse that very day and move over to The Old Republic and see how far I could catch up before the expansion launched. I chose The Old Republic. 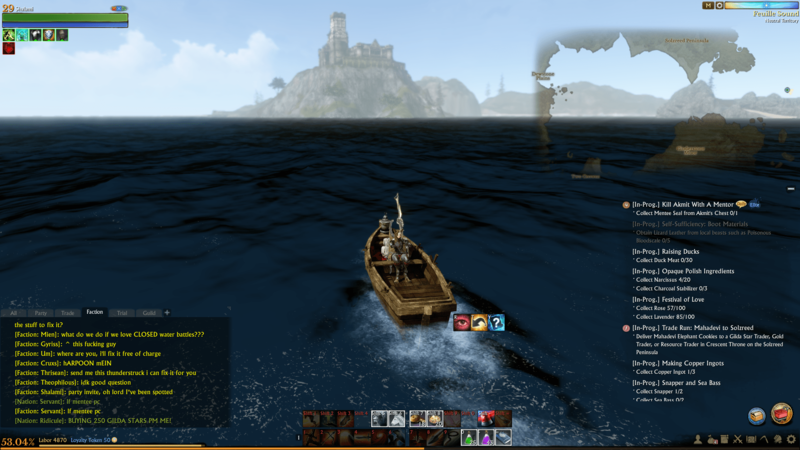 Since this is the last editorial I’ll be writing on ArcheAge for a while, I decided to offer up a few of the reasons that brought me to this decision. As always with editorials, these opinions are my own and do not speak for anyone other than myself. If you agree or disagree, feel free to leave a comment on why. If it isn’t one thing, it’s another. First it was gold farmers using hacks to teleport around the world at whim to finish trade runs, and then they were using exploits to win at arenas. Land is virtually impossible to get your hands on thanks to teleport hacks being used to snag every piece of open space as soon as it becomes available, and accounts are able to maintain the land they accumulate thanks to the prospect for profit far outweighing the cost of taxes that was supposed to make such land seizure impossible. The opposite side of this is that as gold prices on farming sites plummet, money becomes more worthless and prices for auction house goods go up. In addition, I’d just like to know that the fact that I can’t find anything bigger than my 8×8 farm is because of legitimate player competition, not because Chinese gold farmers are teleporting around and buying up lots on Aranzeb. Hack Shield, as with any other game it’s been implemented in, is completely worthless. Aion is in the process of dumping it for something better, ArcheAge should as well. The great thing about games like ArcheAge is that, generally, griefing has some sort of revenge mechanic. Someone is attacking innocent players? Report his crimes and, if possible, murder him so he can spend a good long time in jail. Someone going around uprooting plants on public land? Report the footprints and waste his time and money by either buying a potion or going to court. When it comes to ganking or competing for resources, I am of the mind that you either get big or go home. If you want a 100% safe game, consider playing something else. That being said, in order for this mechanic to work right there needs to be a way for people to fight back. When players in Ultima Online started blocking areas with furniture, Origins made it possible to torch their creations. Eve Online allows corporations to go to war with one another. If someone decides to park their cart on your land and prevent you from planting on it, there is one thing you can do: Nothing, and hope that they get bored and leave soon. The fix to this is a simple one: I should be able to claim/destroy anything that is on my property. Another idea is to implement an ArcheAge version of the Castle Doctrine, where I can shoot anything violating the sanctity of my property. I’ve been told that in the Korean version of ArcheAge, you can actually push other player’s carts out of the way, in which case that should be implemented in the western version. The problem in ArcheAge isn’t the potential for griefing, it’s the inability in most cases to even retaliate. Even well before MMO Fallout started in 2009, I played a lot of MMOs. I won’t say that ArcheAge is the most trolled game I’ve ever played, that award goes out to World of Warcraft Barrens chat circa 2005-2009. What it is, however, is definitely the most racist. I’ve seen racist comments and names in other MMOs, but nowhere near the extent that it exists in ArcheAge, to the point where most of the screenshots I took for my previous articles had to be scrapped or heavily edited to not show chat. I have to put the blame on Trion Worlds for this, partially for the poor filter and also for fostering an environment where people believe that they do not care and will not take action.